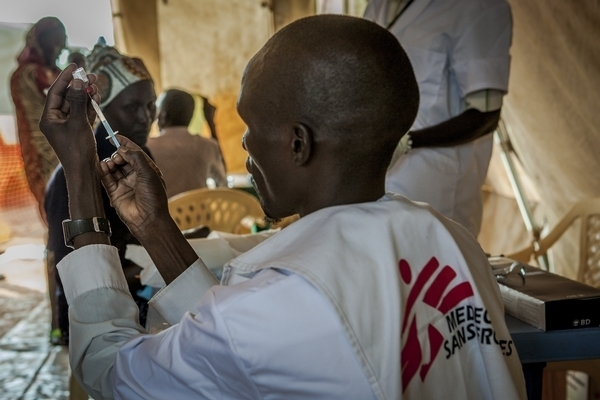 While planning to immunize children against pneumococcal diseases in Yida camp, Médecins Sans Frontières faced multiple barriers trying to purchase newer vaccines at an affordable price and was left struggling to navigate bureaucratic policies that exclude the needs of conflict-affected populations. “Refugee children are incredibly vulnerable to developing vaccine-preventable diseases, so why do we keep hearing the players in the global vaccination community tell us these kids aren’t their problem. We should be making every effort for refugee children to benefit from the newest vaccines, instead of letting them languish in the global community’s blind spot.” Kate Elder, Vaccines Policy Advisor at MSF’s Access Campaign. Moreover, discounted prices that GAVI is able to negotiate are not systematically available to humanitarian actors working in crisis contexts. Despite requests to the actors involved, including pharmaceutical companies Pfizer and GlaxoSmithKline (GSK) that produce these new vaccines, and GAVI, a low global price for humanitarian organisations such as Médecins Sans Frontières has not been established. At the height of the crisis in Yida camp last summer, high mortality rates were reported among young children admitted in Médecins Sans Frontières’ hospital with respiratory tract infections, such as pneumonia, one of the leading causes of death. “The situation in Yida last year was excruciating, with children dying of diseases that vaccines could have protected them against,” said Audrey Landmann, Médecins Sans Frontières project coordinator in Yida at the time. Médecins Sans Frontières determined that vaccinating with the pneumococcal conjugate vaccine (PCV) could result in a substantial mortality reduction in Yida. This is one of the first times that PCV is being used in a refugee camp, and the first time in South Sudan. Médecins Sans Frontières has been working since September 2012 to procure PCV for use in Yida camp but has faced significant delays because of lengthy negotiations and international legal procurement constraints. The companies making the vaccines made an ad hoc donation offer, but Médecins Sans Frontières tries to avoid donations because it seeks a sustainable solution to this problem so it can act swiftly in similar contexts. Médecins Sans Frontières was eventually able to obtain the vaccine from GSK at a reduced price, but delays have now pushed the planned vaccination into the logistically-challenging rainy season. “We’ve been trying for more than four years to find a solution for regular and affordable access to newer vaccines so we can act fast when we need to, but we still have no solution for refugees,” said Dr. Greg Elder, Deputy Director of Operations for Médecins Sans Frontières in Paris.